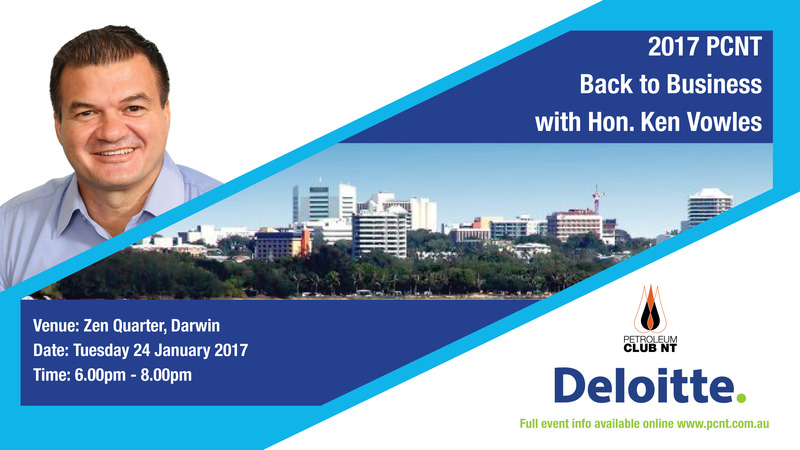 Join us in the expansive Deloitte boardroom with one of Darwin's best views to bring in the new year and celebrate our first Back to Business sundowner event. The event will feature guest presentation from Hon.Ken Vowles, Minister for Resources and Primary Industries and a 2017 business outlook from Deloitte. A great opportunity to network with members and guests from the NT oil and gas sector, stakeholders and the local business community. Mr Vowles is a born and bred Northern Territorian who has been part of the local community he represents in Northern Territory Parliament since attending Jingili Pre School and Primary School in the 1970s. As a member of the newly elected Labor Northern Territory Government Mr Vowles has been appointed the Ministerial Portfolios of Primary Industries and Resources. During the former Government Mr Vowles served in a range of shadow portfolios including Regional Economic Development, Resources, Mines and Energy, Primary Industries, Indigenous Policy, Fisheries, Transport, Asian Relations and Trade and Central Australia. Mr Vowles gained a range of experience while working with disadvantaged people and remote communities across the Northern Territory; Ken held previous position as Manager of Community Education at the Northern Territory Department of Justice and as an Academic Lecturer for Sport, Recreation and Business at Batchelor Institute of Indigenous Tertiary Education. An avid cricketer, Ken spent a large part of his formative years playing and coaching in Australia and overseas. Tickets include a selection of canapes, beer, wine and softdrinks. Places are limited. Please register early to avoid disappointment.